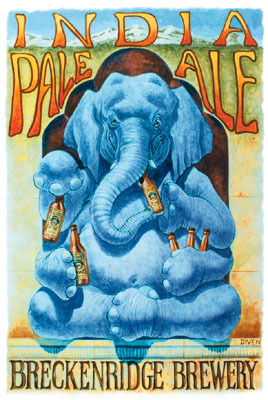 T-shirt and label illustration for Breckenridge Brewery. Acrylic on illustration board. I've actually been an illustrator as long as I've been drawing. My first official illustrations were for our high school literary magazine. Then I drew cartoons for the college newspaper. After art school, I built my reputation primarily as an illustrator, inking anything from quick graphics for t-shirt shops to historical illustrations (some of which have found their way into local history books). My work, in one form or another, has been seen from Australia to the Netherlands: twenty-five years worth of book covers, spot illustrations, cartoon and editorial work. I'd say my strengths are humor and realism, and saying a lot with a little. I do my best work for clients with a solid sense of their own identity and a flair for whimsy. Like all artists, I've done my share along the way of work for which I was ill-suited. But I'm older and wiser and better now, and I won't lead you astray. Take a look at the GALLERY (below) and then we can talk. Editorial illustration for Reddy Communications. Pen and ink. Pencil was my first media, and as I grew competent I added ink work -- quill pen and ink at first, then brush and ink and ink wash. As my skill developed, I moved from the sterile line quality of a quill or technical pen to the infinitely more expressive brush for my ink work. As a result, I could express more with less. At left is a sample of my illustration work for Reddy Communications in Albuquerque, New Mexico. I was Art Director for this electric industry publishing house when I was 26. 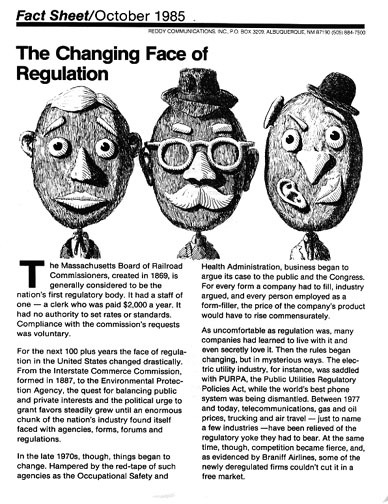 While there, I was the one to create any new drawings of the famous Reddy Kilowatt character. We published some 60 magazines and fact sheets each year, giving me constant opportunity to work with our writers and editor to design and illustrate every story and article. The illustration was done in quill pen and ink in the style I was most comfortable with then. I hardly use it anymore, preferring the speed and broader vocabulary of a sable brush and ink. In the GALLERY below, you'll mostly see samples of brush work (which can resemble woodcut at times), with a dose of my pencil technique tossed in as well. I've also included a detail view that will give you a good sense of the actual texture of my work.